What is Common Size Analysis? Common size analysis, also referred as vertical analysis, is a tool that financial managers use to analyze financial statementsThree Financial StatementsThe three financial statements are the income statement, the balance sheet, and the statement of cash flows. These three core statements are intricately linked to each other and this guide will explain how they all fit together. By following the steps below you'll be able to connect the three statements on your own.. It evaluates financial statements by expressing each line item as a percentage of the base amount for that period. The analysis helps to understand the impact of each item in the financial statement and its contribution to the resulting figure. The technique can be used to analyze the three primary financial statements, i.e., balance sheetBalance SheetThe balance sheet is one of the three fundamental financial statements. These statements are key to both financial modeling and accounting. The balance sheet displays the company’s total assets, and how these assets are financed, through either debt or equity. Assets = Liabilities + Equity, income statement and cash flow statementCash Flow Statement​A Cash Flow Statement (officially called the Statement of Cash Flows) contains information on how much cash a company has generated and used during a given period. It contains 3 sections: cash from operations, cash from investing and cash from financing.. 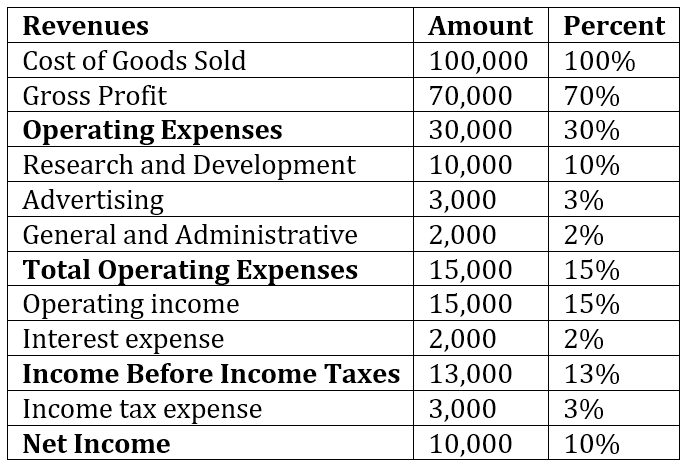 In the balance sheet, the common base item to which other line items are expressed is total assets, while in the income statement, it is total revenues. Common size analysis can be conducted in two ways, i.e., vertical analysis and horizontal analysis. Vertical analysis refers to the analysis of specific line items in relation to a base item within the same financial period. For example, in the balance sheet, we can assess the proportion of inventoryInventoryInventory is a current asset account found on the balance sheet consisting of all raw materials, work-in-progress, and finished goods that a company has accumulated. It is often deemed the most illiquid of all current assets, and thus it is excluded from the numerator in the quick ratio calculation. by dividing inventory line using total assets as the base item. On the other hand, horizontal analysis refers to the analysis of specific line items and comparing it to a similar line item in the previous or subsequent financial period. Although common size analysis is not as detailed as trend analysis using ratios, it does provide a simple way for financial managers to analyze financial statements. The balance sheetBalance SheetThe balance sheet is one of the three fundamental financial statements. These statements are key to both financial modeling and accounting. The balance sheet displays the company’s total assets, and how these assets are financed, through either debt or equity. Assets = Liabilities + Equity common size analysis mostly uses the total assets value as the base value. On the balance sheet, the total assets value equals the value of total liabilities and shareholders’ equityStockholders EquityStockholders Equity (also known as Shareholders Equity) is an account on a company's balance sheet that consists of share capital plus retained earnings. It also represents the residual value of assets minus liabilities. By rearranging the original accounting equation, we get Stockholders Equity = Assets – Liabilities. A financial manager or investor uses the common size analysis to see how a firm’s capital structure compares to rivals. They can make important observations by analyzing specific line items in relation to the total assets. For example, if the value of long-term debts in relation to the total assets value is too high, it shows that the company’s debt levels are too high. Similarly, looking at the retained earnings in relation to the total assets as the base value can reveal how much of the annual profits are retained on the balance sheet. From the table above, we can deduce that cash represents 14.5% of the total assets while inventory represents 12% of the total assets. 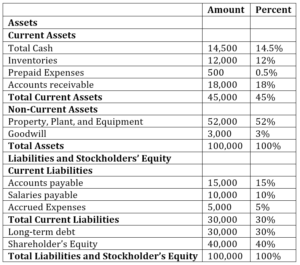 In the liabilities section, we can deduce that accounts payable represent 15%, salaries 10%, long-term debt 30%, and shareholder’s equity 40% of the total liabilities and stockholder’s equity. The base item in the income statementIncome StatementThe Income Statement (or Statement of Profit and Loss) shows performance from operations of a business. The financial statement begins with revenues and is usually the total sales or total revenues. 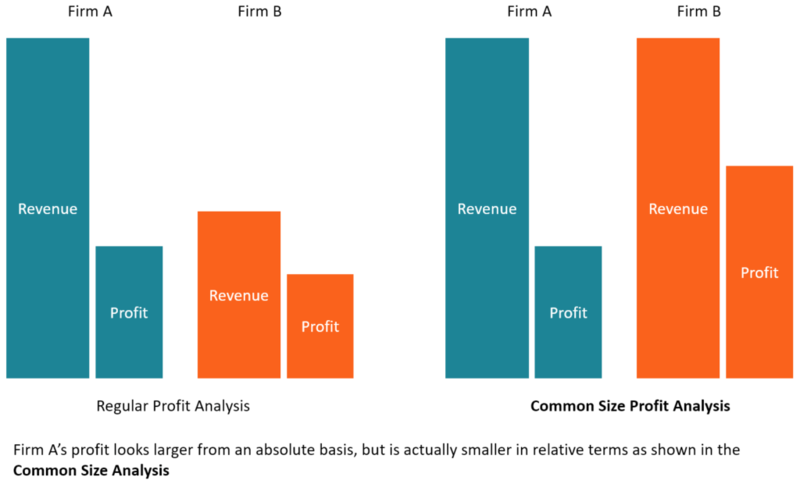 Common size analysis is used to calculate net profit margin, as well as gross and operating margins. The ratios tell investors and finance managers how the company is doing in terms of revenues, and they can make predictions of the future revenues. Companies can also use this tool to analyze competitors to know the proportion of revenues that goes to advertising, research and development and other essential expenses. We can compute common size income statement analysis for ABC Company for 2017. By looking at this income statement, we can see that in 2017, the amount of money that the company invested in research and development (10%) and advertising (3%). The company also pays interest to the shareholders, which is 2% of the total revenue for the year. The net operating income or earnings after interest and taxes represent 10% of the total revenues, and it shows the health of the business’s core operating areas. The net income can be compared to the previous year’s net income to see how the company’s performance year-on-year. One of the benefits of using common size analysis is that it allows investors to identify drastic changes in a company’s financial statement. It mainly applies when the financials are compared over a period of two or three years. Any significant movements in the financials across several years can help investors decide whether to invest in the company. For example, large drops in the company’s profits in two or more consecutive years may indicate that the company is going through financial distress. Similarly, considerable increases in the value of assets may mean that the company is implementing an expansion or acquisition strategy, making the company attractive to investors. Common size analysis is also an excellent tool to compare companies of different sizes but in the same industry. Looking at their financial data can reveal their strategy and their largest expenses that give them a competitive edge over other comparable companies. For example, some companies may sacrifice margins to gain a large market share, which increases revenues at the expense of profit margins. Such a strategy allows the company to grow faster than comparable companies because they are more preferred by investors.